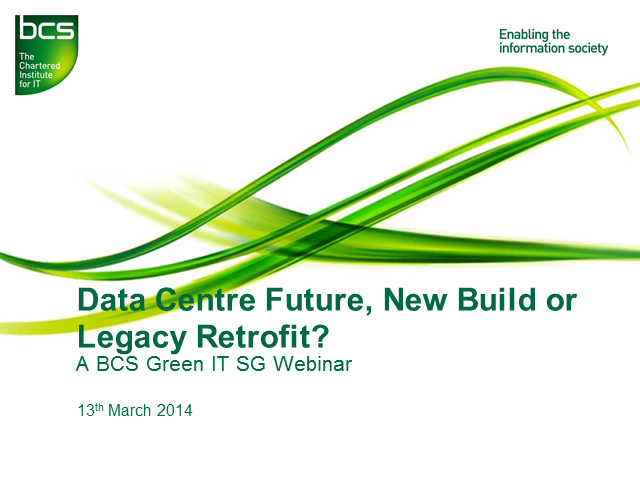 Data Center Futures - New Build or Legacy Cloud Retrofit? IT Departments are pressured into using cloud services, but they face challenges in delivering these services, should they move into new build cloud, legacy cloud or internal cloud via a retrofit of their existing facilities? Join John Booth and guests Bob Crooks of BCS Green IT Special Interest Group, Richard Barrington of ICEOTOPE, Vic Smith of Colt and Gary Thornton of AET4IT for a discussion of the benefits and pitfalls of all 3 and takes a quick peek into the data centre of the 2025. Title: Data Center Futures - New Build or Legacy Cloud Retrofit?